One of the contributions of this weblog to our evolutionary thinking is the call for a more holistic, bi-hemispheric approach to hominid and human origins and, consequently, an increased appreciation of New World monkey behaviors as a surprisingly close parallel to modern human behaviors. Some of the behavioral parallels between humans and New World primates are products of evolutionary convergence, while others may represent retentions – lost from other primate branches – from their ancient common ancestor. A new study by Haslam et al. reaffirms the use of stone tools by New World primates and provides first archaeological evidence for monkey stone tool behaviors outside of Africa. Stone tools reveal worldwide innovations in human behaviour over the past three million years. However, the only archaeological report of pre-modern non-human animal tool use comes from three Western chimpanzee (Pan troglodytes verus) sites in Côte d’Ivoire, aged between 4.3 and 1.3 thousand years ago (kya). This anthropocentrism limits our comparative insight into the emergence and development of technology, weakening our evolutionary models. Here, we apply archaeological techniques to a distinctive stone tool assemblage created by a non-human animal in the New World, the Brazilian bearded capuchin monkey (Sapajus libidinosus). Wild capuchins at Serra da Capivara National Park (SCNP) use stones to pound open defended food, including locally indigenous cashew nuts, and we demonstrate that this activity dates back at least 600 to 700 years. 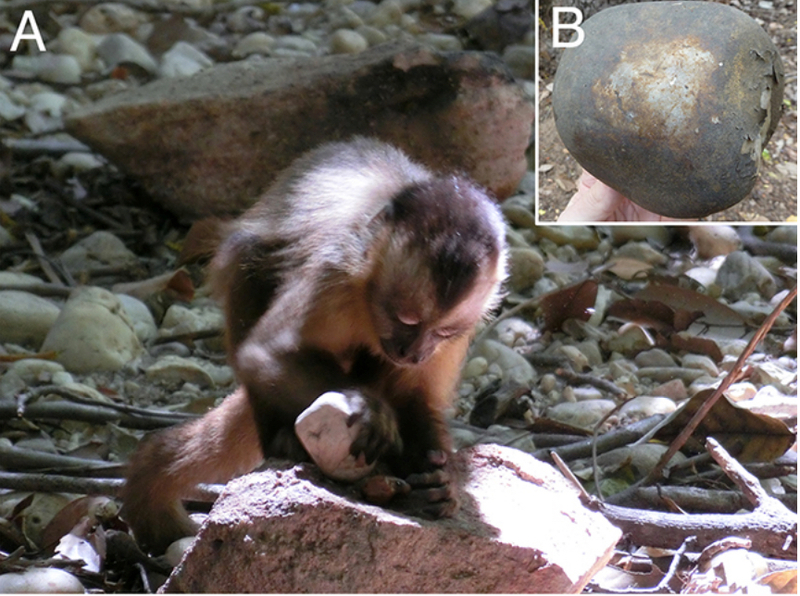 Capuchin stone hammers and anvils are therefore the oldest non-human tools known outside of Africa, opening up to scientific scrutiny questions on the origins and spread of tool use in New World monkeys, and the mechanisms — social, ecological and cognitive — that support primate technological evolution.